Abstract: Zalman's LQ310 is a compact self-contained liquid cooling system built on the successful Asetek watercooling framework. It uses a 120mm wide aluminum heat exchanger equipped with a single, 120mm, 2000RPM fan. Zalman's LQ310 is a compact self-contained liquid cooling system built on the successful Asetek watercooling framework. It uses a 120mm wide aluminum heat exchanger equipped with a single, 120mm, 2000RPM fan. 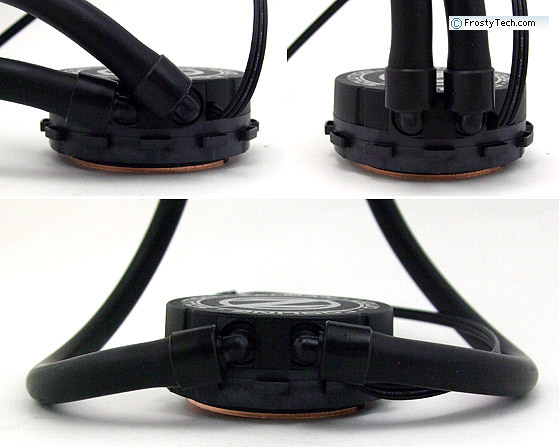 The pump/waterblock is built around a novel micro-skived copper base plate that is connected to the heat exchanger via a 30cm length of flexible rubber tubing. Zalman have released three self-contained watercooling systems built around the same Asetek platform; these include the Zalman LQ310 we're testing here today and the LQ315 and LQ320 units which use 38mm and 48mm thick heat exchangers, respectively. The Zalman LQ310 is the baby of the bunch, with a 27mm thick liquid-to-air heat exchanger. The LQ310 ships fully assembled, plumbed and filled with a coolant. It installs onto Intel socket LGA115x/1366/2011 and AMD socket AM2/AM3/FM1/FM2 processors. A single 120mm PWM fan ships with the unit that spins at 2000-900RPM and moves upwards of 70CFM. Users can attach a second fan if they desire, extra screws are included. 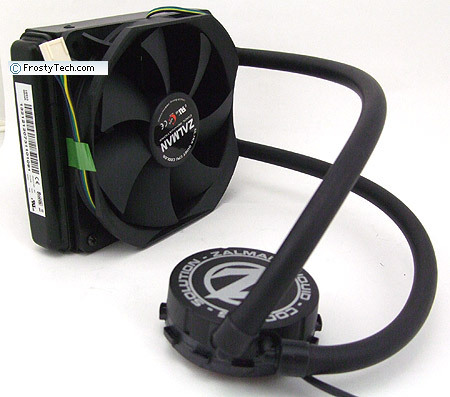 Zalman's LQ310 CPU Liquid Cooler retails for about $76 USD / CDN. Because we like our readers, Frostytech is taking the extra step of testing the LQ310 with a second (exhaust) fan attached, but please keep in mind only (1) one fan is included in the retail box. 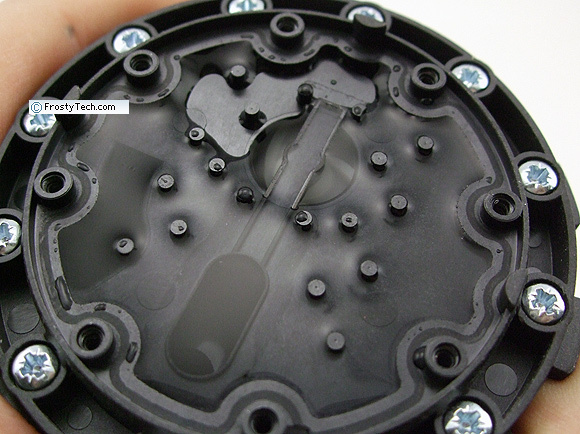 The pump head / water block measures 28x72x72mm in size and mounts directly onto the processor. No information is disclosed about flow rate, pump head or pump speed... but we do know it's made by Asetek. The pump doesn't generate much noise and power comes from a single 3-pin motherboard fan header. There are no lights on the pump/waterblock to indicate its operational status, which one thing we wish the LQ310 did offer. 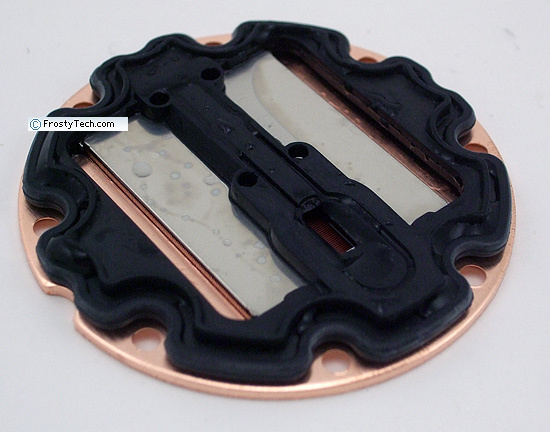 Frostytech prefers water blocks that have a little LED illumination to reinforce the operational status of this critical part of the cooling system. We've forgotten to plug the pump a couple times while testing all-in-one liquid coolers... be sure to double-check your connections! The 11mm OD rubber tubing that connects the waterblock to heat exchanger measures ~30cm long. The 90-degree plastic pipe connections coming off the waterblock swivel to make routing the hoses a little bit easier. 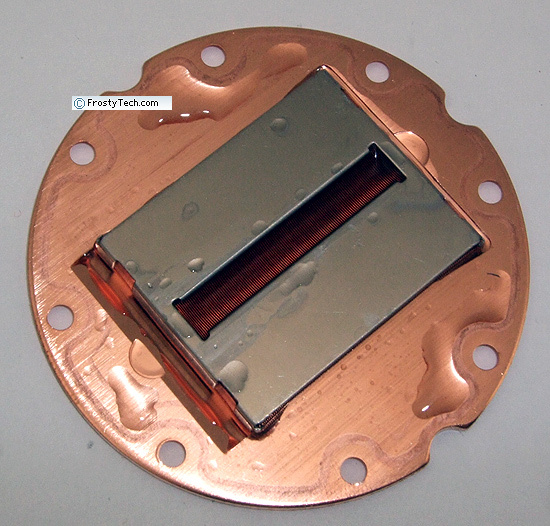 Inside the LQ310 waterblock we find a micro-skived copper plate, stainless steel flow directing shield and combination O-ring/gasket. Propylene Glycol based coolant is pumped in through the little hole at the center-line of the heat spreader, it then flows through the micro-skived copper fins where it picks up the heat and exits at the sides where it moves on to the liquid-to-air heat exchanger. The skived copper fins are very densely packed together to create the largest surface area possible in roughly a 30x30mm area. 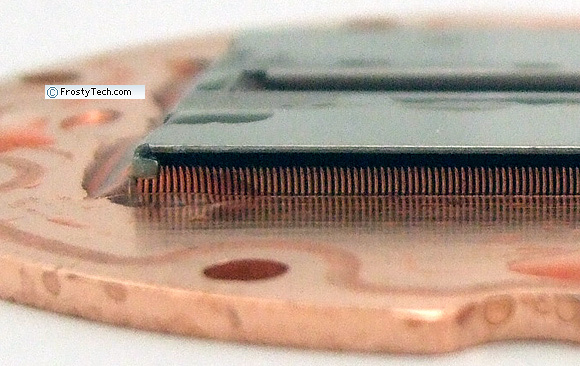 The skived copper fins are about 4mm tall. 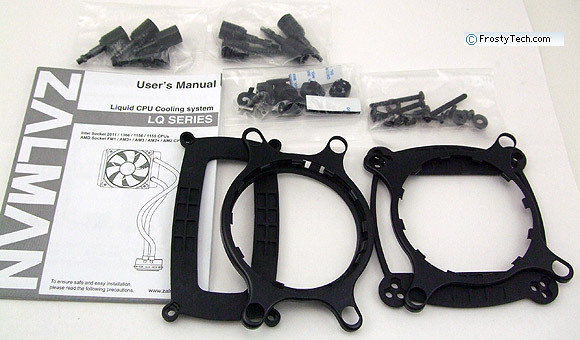 This waterblock design is common to the Zalman LQ310, LQ315 and LQ320 models. The LQ310's aluminum heat exchanger is 27mm thick and measures 153x120mm in size. This heat exchanger ships with one 120mm (2000-900RPM) fan attached, but does support front and rear mounted fans. 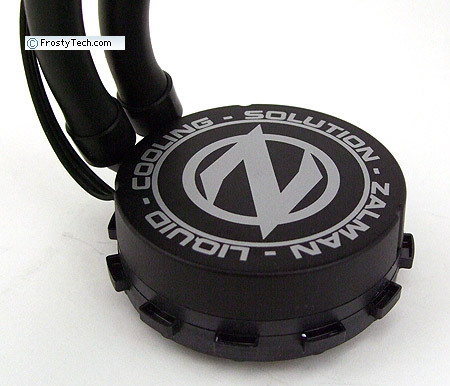 As with all other self-contained CPU liquid coolers, you'll need to install it into a PC case with at least one accessible (rear or top) 120mm fan vent. The heat exchanger mounts to the inside of the chassis with four screws through the fan vent. Always install the heatsink fan so hot air exhausts out of the chassis. The Zalman LQ310 is compatible with Intel socket LGA2011/1366/115x and AMD socket FM2/FM1/AM2/AM3 processors. It does not support LGA775 processors. 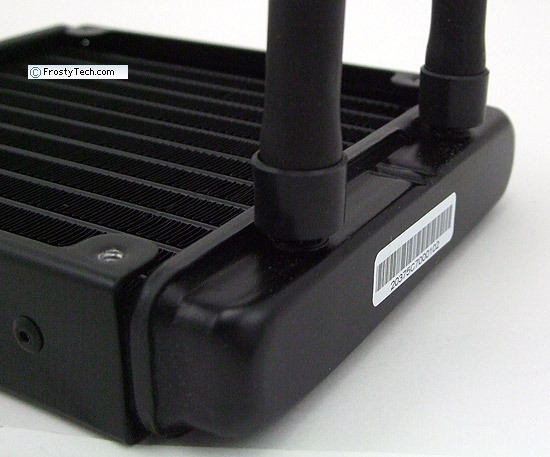 The cooler ships with two motherboard brackets and a pair of metal mounting plates that attach to the pump head to facilitate each particular socket.